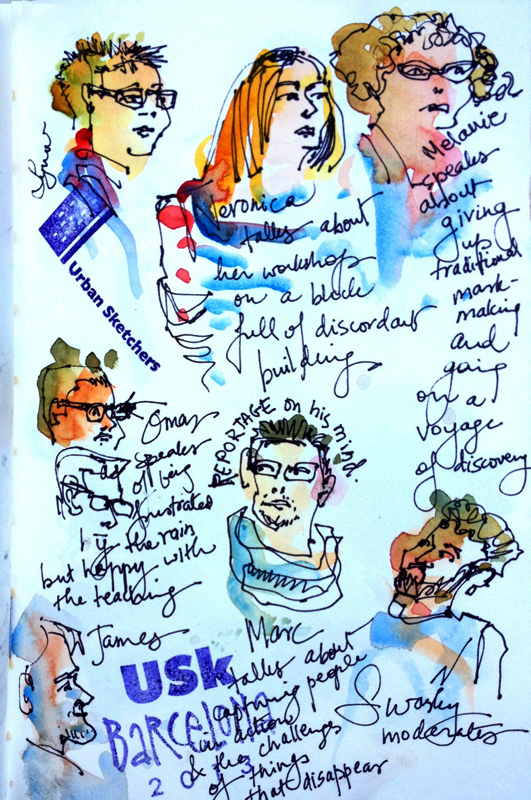 Day 2 at the Urban Sketchers Symposium was off to an early morning start with a panel discussion with instructors from the previous day's workshops. Eduardo Bajzek's 10am workshop was an eyeopener. Eduardo uses markers in such a painterly fashion. His two mantras are: 'Large to Small' and 'Mass not Line'. Lynne Chapman's 'Sketches that Sing' workshop dealt with the use of color in non traditional ways, and with mark making. Choni Naudin lead the Bookbinding demo at Sant Lluc. What a gorgeous setting it is for a workshop! 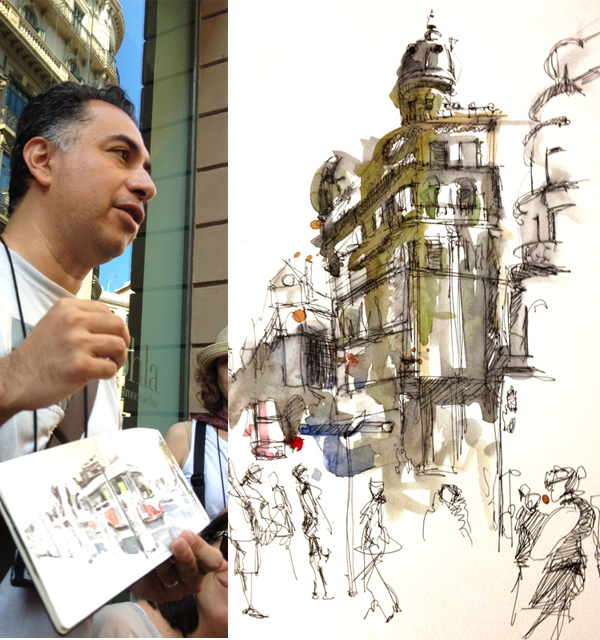 Norberto's 'Dynamic Ink' workshop was all about using non-waterproof ink in sketching. It was so liberating to draw and then see the water make some of the lines disappear. I did a quick little sketch before heading out to the next workshop. 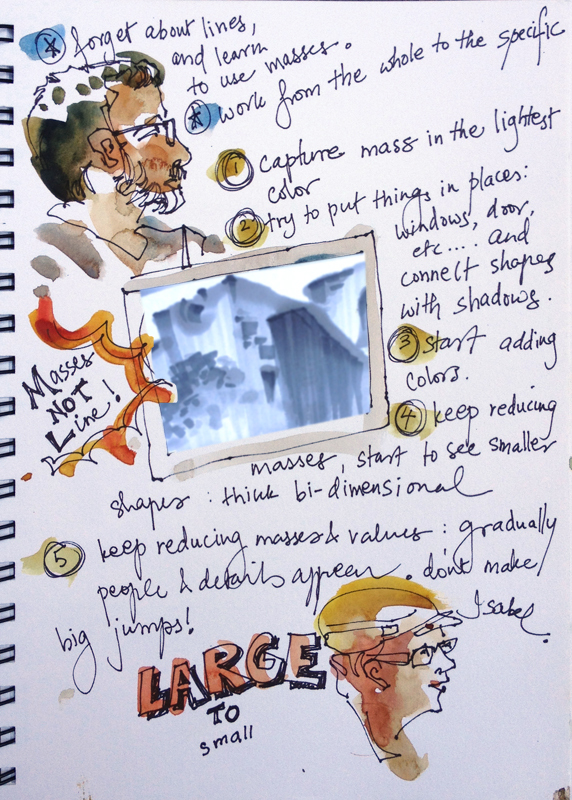 I just HAD to run over and catch an hour at Jim Richards' 'Life between Buildings: Capturing the Energy' workshop. What's not to love in a workshop that encourages you to draw the crowds. Have you ever drawn a crowd of people and noticed they look like layers of people floating around a page? Here's a little tip from Jim that I will never forget: however many people you have in a scene, all of their eye level, whether they're close or far from you, is at the horizon. 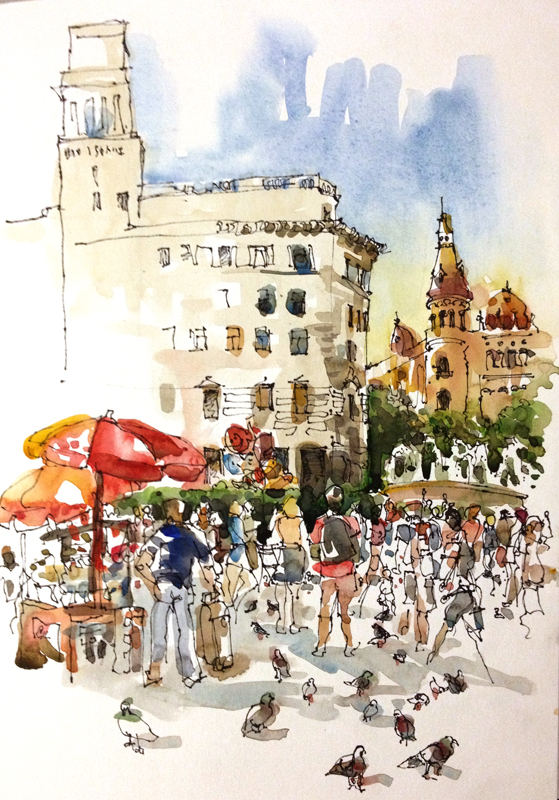 We sketched the crowd at the Placa Catalunya: the tourists, the little kids, the balloon sellers and the pigeons. And a sketch in the early evening. The Sant Pere Nolasc church near CCCB, Barcelona. It's Friday and the crowds are already gathering at every bar and cafe. 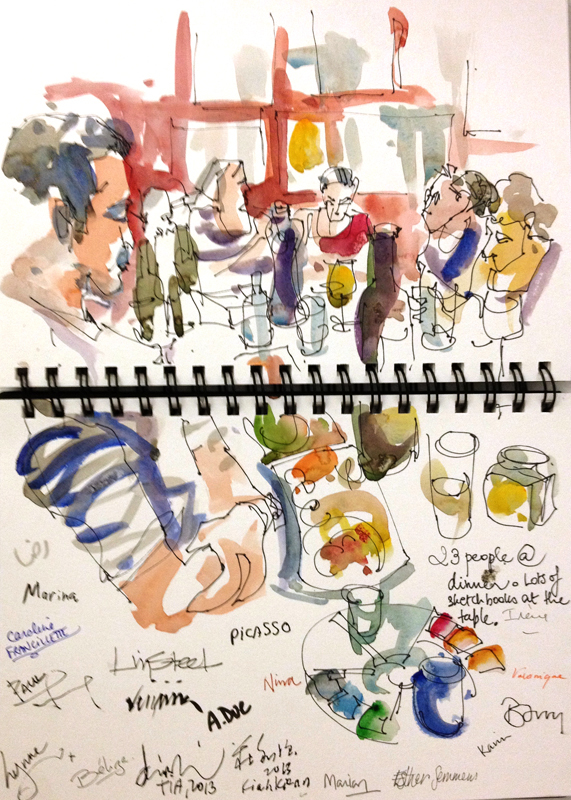 If you're wondering why these posts go up in the wee hours of the morning, imagine this: 23 Urban Sketchers at one table. A dinner that arrived with long pauses between courses. Almost everyone at the table was sketching. Day 3 of the symposium coming up tomorrow. 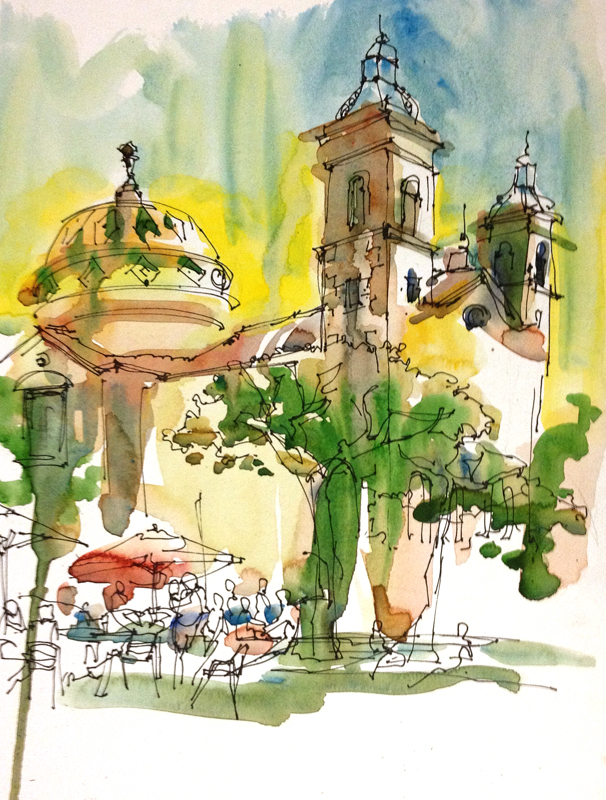 Can't get enough of Usk Barcelona? 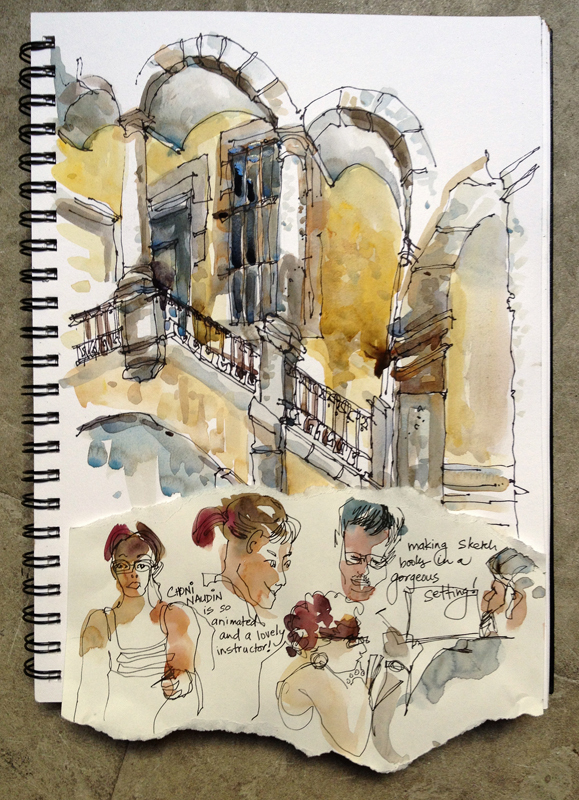 Go to the Usk Barcelona flickr group to see lots more from Barcelona.